James Ingall Wedgwood was born in London in 1883, the son of Alfred Allen Wedgwood, son of Hensleigh Wegdwood and Rosina Margaret Ingall. He studied at University College, Nottingham, with the intention of making a living as a chemist, but found himself attracted to what is commonly called 'High Anglican Church' worship and he became an altar server and was later sent to York Minster, where as choirmaster he trained boys in plainchant. 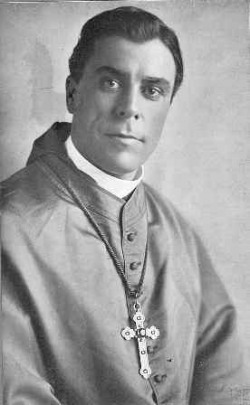 As a young man Bishop Wedgwood was exposed to the influence of Dr. Annie Besant in 1904 and this lead him to explore Theosophy, Co-Freemasonry, Martinism and Rosecrucianism as personal interests. Wedgwoood joined the Theosophical Society much to the disappointment of his Anglican colleagues and this put an end to any aspirations he may have had for Anglican Ministry. In 1913, Wedgwood became aware of the 'Old Catholic Church' in England and wrote a letter to Archbishop Arnold Harris Mathew. Mathew’s reply stirred his interest and rekindled Wedgwood's interest in both the church and in entering holy orders. They exchanged letters for a time and Wedgwood explained his affiliation to the Theosophical Society. Mathew did not express any concern over the matter at the time. The same year, Wedgwood was re-baptised and confirmed sub-conditione, received the Minor Orders including the subdiaconate. He was later ordained a deacon and finally a priest on 22 July 1913 in London. In 1916 Bishop Wedgwood was consecrated to the Episcopate by Bishops Samuel Willoughby, Rupert Gauntlett and Robert King. This began a journey which ended with the establishment of 'The Liberal Catholic Church' in every corner of the world. Wedgwood spend his latter days at Tekels Park in Camberley, serving as Priest in Charge at the Church of St Francis of Assisi until 1950.